Chief rabbi ("ḥakam bashi") at Constantinople from 1860 to 1863; born 1794; died 1874. He was a capable Talmudist and conversant with several foreign languages. Avigdor was instrumental in organizing several institutions in the Turkish dominions, among them the Assembly of Jewish Notables, which latter has introduced many beneficial regulations. 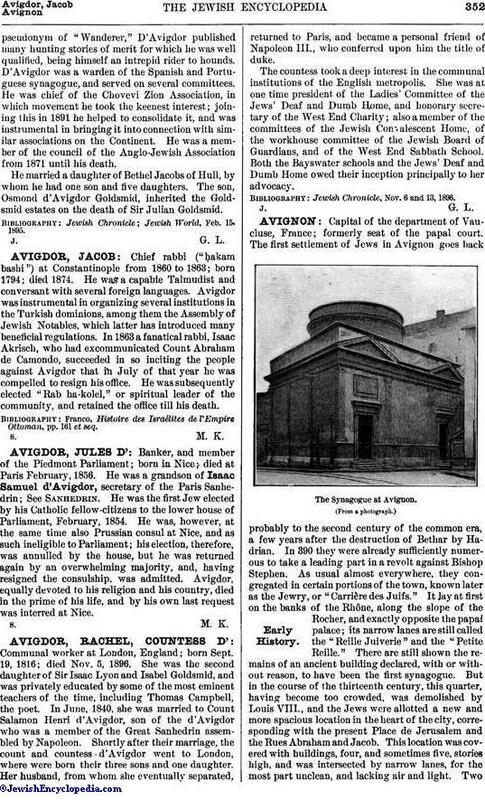 In 1863 a fanatical rabbi, Isaac Akrisch, who had excommunicated Count Abraham de Camondo, succeeded in so inciting the people against Avigdor that in July of that year he was compelled to resign his office. He was subsequently elected "Rab ha-kolel," or spiritual leader of the community, and retained the office till his death. Franco, Histoire des Israélites de l'Empire Ottoman, pp. 161 et seq.